A large section, nearly 90 percent, of poor women in India is working in the informal/unorganized sector. Considered a low growth sector, attention in terms of investment, protection and regulation, support structures, skill up-gradation, backward and forward linkages are minimal. Unions and bargaining power in this sector has been low as there are few formal unions. Conditions of social oppression, poor living conditions, large families, child labour, illiteracy exist are the major concerns. While the informal sector in South India represents better work conditions, it is entirely different in its cultural setting for poor women as their powerlessness is enhanced by the barriers of caste, class and gender. 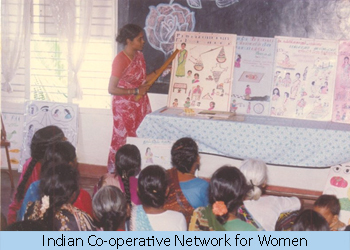 It is in this environment of powerlessness that the Working Women’s Forum (WWF) and the Indian Cooperative Network for Women (ICNW) intervened to help poor women create the foundations of a new development model. Based on altered gender relations, it challenges structural poverty, spearheads social integration, and by transforming labour into capital with the surplus retained for poor women’s needs. To achieve any results in terms of development, the WWF/ICNW challenged the five pillars in its manifestation related to gender discrimination. ‘Five interwoven threads of oppression can be discerned as class exploitation, caste inferiority, male dominance, isolation in a closed world and physical weakness’. By organizing poor women in the informal sector as shareholders in credit cooperatives at nominal interest credit, the above discriminations were countered. ICNW provided requisite social protection through group delivery savings, training, legal awareness, and insurance products. Digitalization and automated software are operated by women members from fishing community, daily wage labourer and the members of the ICNW credit operations. ICNW adopted an innovative bottom-up structure, and its various training facilitated the women to participate at all levels of the organization. The initiative demonstrated even the poorest and semi-literate women could manage institutions with the right kind of training and field exposure. It has infused confidence among the members, raised their standard of living upholding human dignity, and helped redistribution of resources towards ensuring social justice and positive social change.